Since Patience and her friends have so many special diets among them, which includes a couple of vegetarians and some gluten-free folks, I figured that the best way to make everyone happy was to throw a STLVegGirl Vegetarian Party. While I love dining out, I now understand how hard it can be to “find something you can eat” when you venture out to a new restaurant. While STLVegGirl (aka Caryn Dugan) doesn’t regularly focus on gluten-free, she had no problem coming up with ways to work around wheat items in her menu as well. What was really satisfying was to hear our friends say they were full by the end of the night. Sure beats trying to put side dishes together to make a meal! I decided to start with STLVegGirl’s world-famous hummus, which uses tahini paste and tamari as the secret ingredients, and instead of using pita chips, STLVegGirl was thoughtful enough to purchase a bag of gluten-free chips instead. This way my guests had something to snack on as Caryn worked on the next course, Zucchini Sliders with Herbed Mayo. I had seen STLVegGirl create these sliders on a local morning show and I wanted to try them for myself. The sliders usually get their thickness from bread crumbs, but since we were going gluten-free, STLVegGirl brought gluten-free bread and we made our own. (We also skipped out on the mini-rolls to make a sandwich.) My other favorite ingredient was the 21 Salute seasoning (found at Trader Joe’s) that was mixed tino the Veganese, that replaced regular mayo. Next up was the “dinner” course and STLVegGirl started us off with a Crunchy Kale Tahini Salad. The tahini paste and tamari showed up again in the dressing for the salad, but my favorite salad ingredient was the “feta cheese” made from firm tofu. My other favorite cheese substitute that was used is nutrional yeast, which gives foods a cheesy nutty flavor. I have used it in the past to mix in with pasta sauce. We finished the night with Italian Tempeh Meatballs, which could also be made into a meatloaf if you prefer. The “meat” was actually tempeh, a fermented soybean cake, and was chopped up into chunks. All your usual meatball seasonings and marinara sauce can be added like usual. Again, to avoid the bread (for a meatball sandwich), we just used toothpicks and forks. 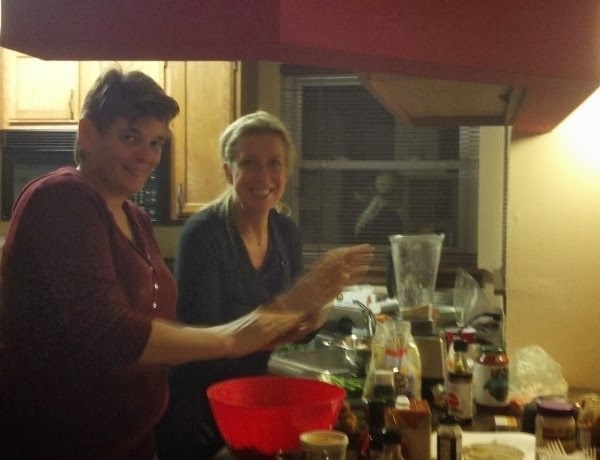 If you wish to throw your own vegetarian party, or are interested in classes or a personal chef, all of STLVegGirl’s contact information can be found on her website listed below. STLVegGirl can be found on Facebook and Twitter as well!